From day to day Apple will release OS X 10.9 Mavericks which will brake Snippets Expander functionality. Snippets is one of the many helpful tools that requires you to "Enable access for assistive devices" to be able to do more than allowed by default. In pre-Mavericks versions you have to go to System Preferences -> Accessibility and check an option named "Enable access for assistive devices". 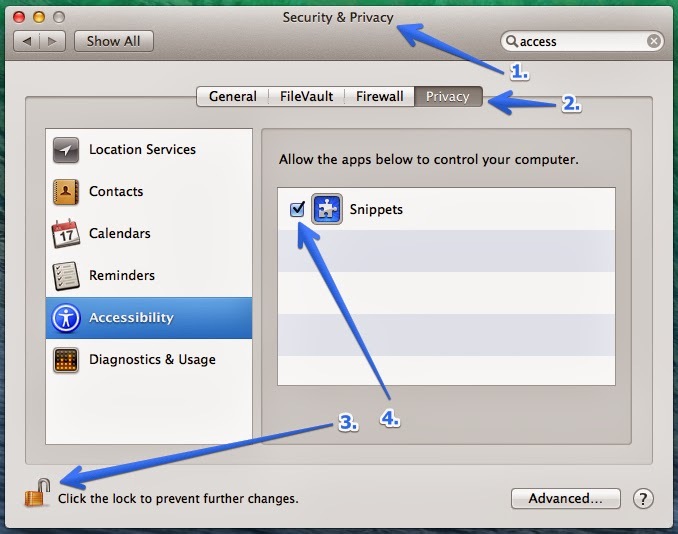 If you try to do the same on OS X 10.9 you will have difficulties finding this checkbox. It's gone. Well, hopefully they just moved it to another place. Now you have to open System Preferences -> Security & Privacy -> Privacy -> Accessibility and enable Snippets in the listing. You may also need to click on Lock icon and enter your password to unlock preferences from making changes. It allows Snippets to listen for keyboard events made in other apps. This is needed to know when you type a tab trigger string and pressed a tab key to replace it with actual snippet's code.